Contributor review today from the lovely Tori! Chest heavy and teary eyed... 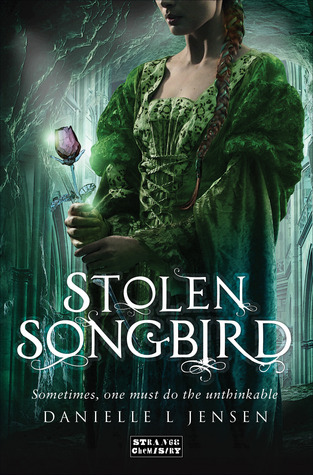 I closed Stolen Songbird and wished fervently that I had taken my time and traveled slowly through this book. But alas, as with all truly wonderful books, it ended much too soon. I wanted tos cream my frustration and reread the last page just to make sure that I wasn't missing the next book tucked behind the Acknowledgements section. I was nervous when I ventured into the first few pages because Chapter 1 did not amaze me as much as I'd hoped. Shoulders slumped, I decided to keep trudging along. But before long, I was hooked beyond hope. As in up-late, eyes-beginning-to-twitch-from-sleep-deprivation kind of hooked. It was starting to seep into my little private cubbyhole and dive back into this world beneath the mountain. Of course, my lunch sat next to me all but forgotten and touched. Cecile de Troyes was my ticket into a buried city. An aspiring singer, she was plucked off her horse on the way home and sold to beings the likes of which she had never dreamed in exchange for her weight in gold. She was to wed a troll to fulfill a prophecy that would save an entire city of trolls that had been cursed to live beneath the mountain for centuries. Cue Tristan e Montigny who quickly puts an end to the stereotype that all trolls are ugly. Oh no, he is tall, brooding, sarcastic, and of course completely gorgeous. But his impending bond to the redheaded prisoner, Cecile, is a command that he has no choice but to follow. Once the two are bonded, they are literally linked. Their emotions flow in and out of each others mind and they are able to find each other anywhere within Trollus. Ah yes, Trollus. We cannot forget such a beautifully envisioned city. Jensen equisitely crafted this underground world so that you feel like you are walking its cobblestone streets right along with Cecile. It didn't take me long to realize why I liked her so much. She was human, no pun intended. She made mistakes and she vowed not to make them again. Cecile was almost completely alone in a foreign city where her humanity did little at first to procure her any allies. Her persistent attitude is what I wanted to see - a strong and compassionate main character that decided to fight instead of fade. Fight for new friends and a new found love. My only teeny-tiny complaint would be the major twist in the plot line. With a few very large hints placed here and there I was able to quickly ascertain the true origin behind the inhabitants. Which of course, I will NOT reveal. I was just hoping for a little more intrigue behind that specific bit of story. I give this book 5 quills, regardless of teeny-tiny complaints. I feel in love with the characters and a brilliantly rendered story. I am now however forced to wait until next year for the second book in the Maediction Trilogy. I'll be grudgingly patient I suppose. Good books and happy endings are worth waiting for if you ask me.